Finder 55.32.8.230.0040 DPDT 10A, 230V AC Coil, AgNi Contact, General Purpose Relay by FINDER at Dupen Labs. MPN: 55.32.8.230.0040. Hurry! Limited time offer. Offer valid only while supplies last. Series 55 General Purpose Relay, 2 poles 10 Amp. Specifications: DPDT 10A, 230V AC coil, AgNi contact. Options: lockable test button & mech. View More In Electrochemistry Accessories. Series 55 General Purpose Relay, 2 poles 10 Amp. Specifications: DPDT 10A, 230V AC coil, AgNi contact. Options: lockable test button & mech. Indicator. 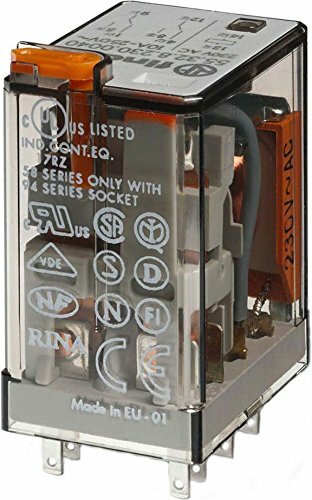 Series 55 General Purpose Relay, 2 poles 10 Amp.